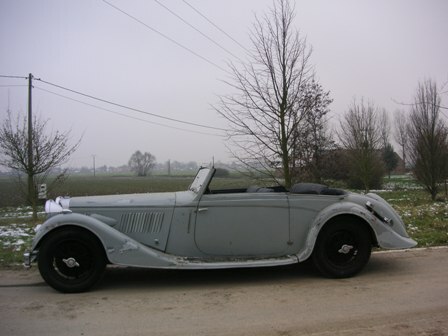 It is perhaps surprising, given that France is Britain’s nearest Continental neighbour, very few Alvis cars, pre or post-war found their way to that country. This is in stark contrast to the Netherlands, where Alvis exports abounded. Think ” Alvis “, and ” France ” together, then the most obvious (and best documented) association is that with the Gnome-Rhone aero-engine manufacturers in Paris from 1935 which led to numerous developments. Back to the cars however, and there are at least two notable exceptions. The first occurred in the summer of 1926, when T.G. John commissioned a saloon body on 12/50 TG chassis No 4431 from Vanvooren of Paris. Whether or not Vanvooren ever used it for exhibition purposes is not presently known, but the car duly returned to Coventry where it was registered RW 8744 around 4th October 1926. Sadly, no image of this car has yet come to light. 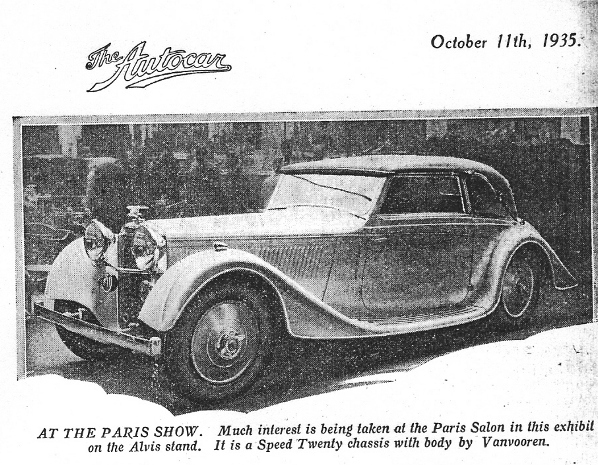 Fortunately however we know quite a bit more about the second example of a Vanvooren Alvis, when the fifth SD Speed Twenty chassis to be built, 12779, about September 1935, crossed the channel and after bodying by Vanvooren was a star exhibit at the Paris Salon of that year. ” The Motor’s ” Show Report of October 8th 1935 also relates that a polished chassis was present as well. All this of course is coincidental, in timing with the Gnome-Rhone negotiations referred to earlier. But was there also another catalyst? 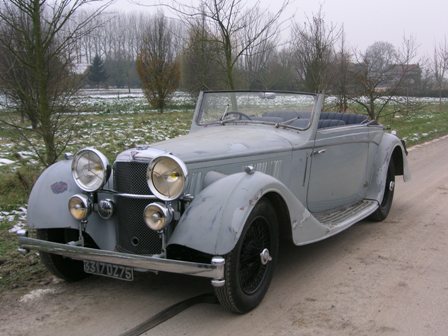 It is not widely known that a prominent Alvis employee was quite conversant with Vanvooren, E.R (Roland) Fox, son of Edwin (he of Vanden Plas Coachbuilders, of Kingsbury) had taken up a position with Alvis, progressing well up the echelons of management where it is known at one stage he was allocated the mysterious experimental “Ace ” car (VC 9368, chassis 9130). Brian Smith (Vanden Plas chronicler ) relates that after Technical Training at the Regent Street Polytechnic, Roland Fox went off to Paris to study the work of Chapron, Kellner AND Vanvooren, later proceeding to Geneva and doing the same at Carrosserie Gangloff. lt is thus fairly obvious that by the time he took up his new position with Alvis Ltd. Roland Fox must have known as much about continental coachbuilding as anyone in Coventry at the time, and his role may well have been pivotal in the the construction of the Speed Twenty Vanvooren, before he returned to the Vanden Plas” family ” firm. The Vanvooren car created a lot of fascination over the years, particularly with illustrator (and former Alvis Owner Club SD 20 model Secretary) Tony Phillips-Smith, who conducted much research, establishing that it must have escaped the occupation during World War Two, and that for many years it resided with the Pozzoli family (Serge Pozzoli being a greatly respected automotive chronicler, and Bugattiste.) Tony’s research also encompassed the Vanvooren company itself. It was Tony who alerted me to the fact that the Vanvooren Alvis had been re-imported to the U.K. by collector Brian Classic, and it is Brian who kindly allowed me to visit him and view this most interesting car. To say that it has a presence would be an understatement. I learned much from this visit. The Works Guarantee Card for the vehicle merely records the first owner as ‘Bouregon’. A plaque on the facia panel goes further denoting the name George Bouregon d’Hubert, and the address l44bis, Boulevard du Montparnasse. There the artistic connection continues for I have subsequently established that the address is now an art gallery, proprietaire : Rosemarie Napolitano, who specialises in the work of Lea Riviere, so a fitting and serendipitous rounding off to this story. It brought back some happy memories for me too, when as a student I had elected to do a thesis on Coachbuilding. This of course necessitated visiting as many of the ateliers as possible. In the course of this I met Roland Fox, and at Hoopers : Osmond Rivers, who had been one of E.R.F’s tutors at the Regent Street Polytechnic. Most memorable of all though was meeting H.G.R.N. (Herbert) Nye, designer of the Bentley Continental, at H.J. Mulliner. He gave me some general arrangement drawings of some of his designs which I still treasure.